Creative Company in the news. There's always something new to shout about at Creative Company ... get the latest here. (July, 2018) A square, roll-fold brochure to promote weddings at Salem Convention Center has earned a GOLD in the Summit Creative Awards, Consumer Brochure category. 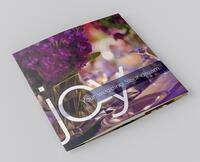 With brief text and beautiful photos, the brochure rolls out to reveal a new image and support text on each panel. It has already captured interest with brides and wedding planners. In addition, a website designed for the Dragonberry Fruit Club, at www.dragonberryclub.com, earned a Silver in the consumer website category. The Summit Creative Awards received more than 5000 submissions in multiple categories from 26 countries. Only 1% of entries received a gold, and only 5% received silver. (September, 2017) Jennifer Larsen Morrow, owner of Creative Company and a recognized marketing expert, is now a part-time advisor at Chemeketa’s Small Business Development Center, located at 626 High Street in Salem, Oregon. Business owners and managers may schedule a no-charge consultation with Morrow to discuss specific marketing-related issues—from website review to brand analysis to best practices for social media, print and online marketing. Morrow will also be teaching a series of marketing classes in Fall of 2018. Other professional advisors with SBDC provide business expertise to help any business grow and thrive. To book a no-cost consultation, call SBDC at 503-399-5088. (March, 2018) Creative Company's president, Jennifer Morrow, and Third River Marketing's president, Tim Fahndrich, have partnered to provide branding, messaging, online marketing and reputation management for Willamette Family Medical Center in Salem, Oregon. Creative Company has led internal brand workshops, developed a new identity system and brand messaging. Third River is building a website and defining an online marketing strategy. (May, 2018) Oregon Martin Group, a three-woman real estate group under the Berkshire Hathaway HomeServices | Real Estate Professionals brand, tapped Creative Company again to develop a campaign focused on winery and vineyard property in Oregon. The Oregon Martin Group logo design and messaging were developed by Creative Company in 2016. The goal of broker, Kelly Martin, is to bring more attention to services for those looking to buy or sell wine-related properties in Oregon. A rack card information piece and focused website are key elements of the campaign. (July, 2018) Creative Company’s Jennifer Morrow completed a brand messaging hierarchy for PECAA, Professional Eye Care Associates of America, an association of independent eye care professionals located in Portland, Oregon. To create messaging for members and potential members, PECAA leadership first participated in a branding workshop led by Morrow. Selected members and vendors were then interviewed by Morrow to gain further insight into perceptions. Morrow worked with the marketing team through a series of drafts before finalizing the hierarchy. Final messaging is a platform for all communications, both online and in print. Key phrases can be extracted to use as headlines, to structure sales presentations, to frame a website and provide direction to ongoing communications. PECAA’s internal marketing team will incorporate the new messaging into their ongoing marketing program. For media questions or more information about our services, see our contact info to the left.